The sun is noticeably low in the sky these days, as we approach another Alaskan winter, and by mid-September, we were already dropping below freezing at night. In the midst of the winter darkness, the KNOM signal is a beacon of light. We give to you our heartfelt thanks for your generosity, which maintains that positive, informative and inspirational beam, 24 hours a day. We fervently pray that Our Heavenly Father will bless you and those you love abundantly. 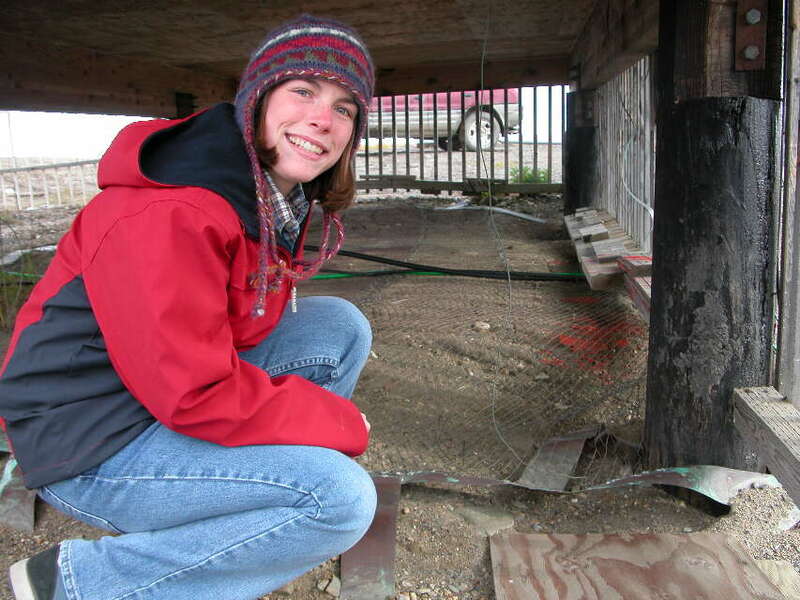 THAT SINKING FEELING (left): Volunteer produc-tion director Emily Barrett looks underneath the KNOM transmitter building, where the permafrost has sunk, exposing our copper straps and screening. At press time, we were ordering two dump truck loads of gravel and organizing a bucket brigade to bring the soil up to grade. We’ve been having hard frosts at night, so we’d better hurry! EDUCATIONAL SPOTS in September dealt with: alcohol and drug addiction recovery, tetanus, stress, safe driving, AIDS, avoiding electrical shock, fire prevention, finding help for domestic violence, botulism prevention, cancer signs, violence prevention, the cold virus, medical emergencies, American history, early childhood development and many other topics. DINNER WITH WALTER CRONKITE: It was a magical evening, as the Alaska Broadcasters Association honored the veteran broadcaster at a special dinner in Anchorage. KNOM’ers Tom Busch and Ric Schmidt spoke with Cronkite briefly, and Tom was surprised to discover that Cronkite remembered him. In 1982, Tom, who was ABA president at the time, introduced Cronkite at his first Alaskan public appearance. 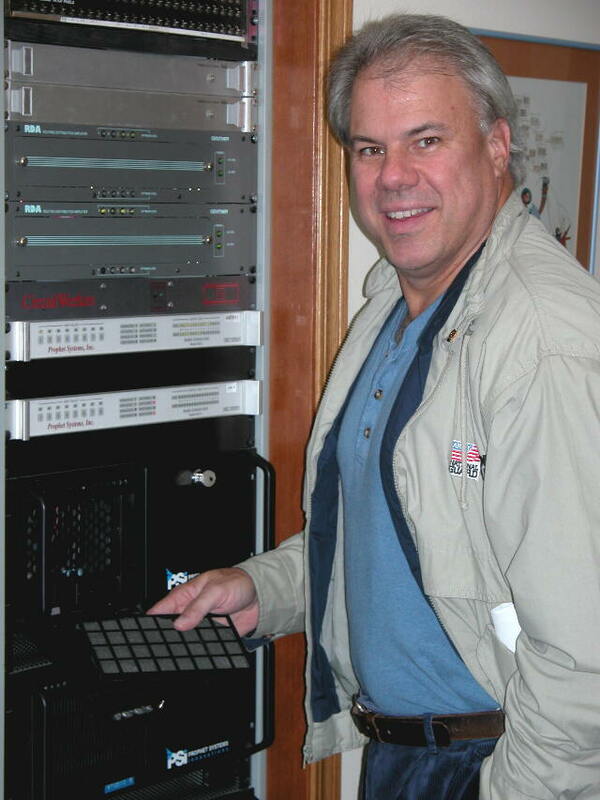 KNOM is the oldest Catholic radio station in the United States, serving remote western Alaska villages since 1971. It’s a vast region. In Nome, we are more than 500 miles from the nearest highway! INSPIRATIONAL SPOT: Life is very fragile. Handle with prayer. FAIRS’ FAIR: It’s the time of year when Catholic colleges around the country host volunteer recruiting fairs; these fairs are the source of about half of our crew of five full time volunteers. By the time you receive this, we’ll have already visited Marquette and Loyola (Chicago) Universities, and the University of Notre Dame. About half of the KNOM staff are volunteers, whose gifts of a year or more make the station financially possible. Complete volunteer information is available at www.knom.org/volunteer/vol.htm. 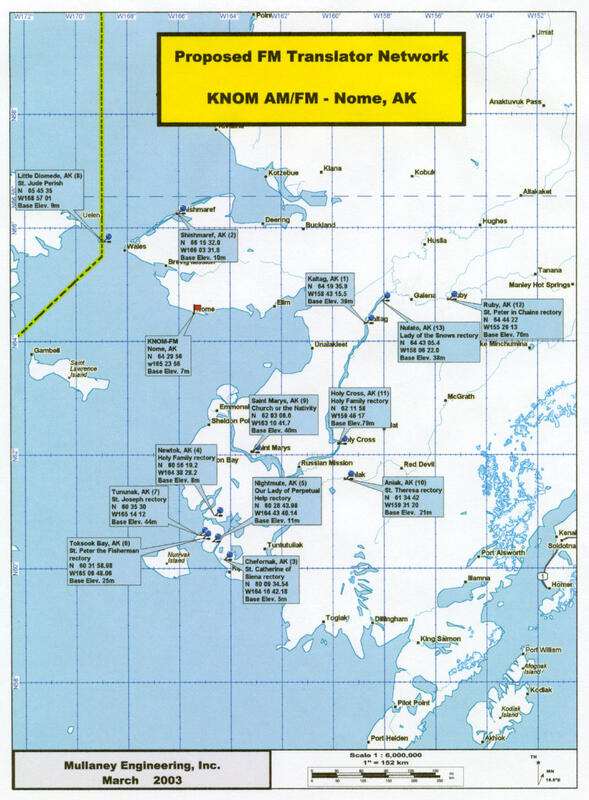 APPLYING OURSELVES: Consulting Engineer Jack Mullaney has filed final applications for KNOM translator stations in the far-flung villages of Little Diomede, Holy Cross, Kaltag, Nulato, Ruby, Aniak, Tununak, Toksook Bay, Newtok, Shishmaref and St. Marys. (Left) This map locates the sites for the remote translators. The FCC accidentally dropped two villages, Chefornak and Nightmute, from their list of places where frequencies for translators were not contested. As a result, we were not allowed to file final applications for translators in those villages. According to the commission, the two villages will be added at a later date. Approval to construct the translators may take months, or may take years. The translators will provide the first primary radio service to some of these villages. In some, KNOM can be heard faintly, in others not at all. We sincerely thank Jack for contributing his work to us at no charge. Without his dedicated help, this important project would not have been possible. (Left) Toward the left of this picture, you can see the long, white roof of St. Teresa Parish’s church, where a KNOM translator will be located in the village of Kaltag. At the lower right, a couple of small boats are tied to the bank of the Yukon River. WILLFULLY: Please consider adding missions like KNOM to your will. For most of us, a bequest will be the largest selfless gift we will ever make. At KNOM, we place all bequests into funds that provide for future major improvements and protect the mission against unforeseen emergencies. INSPIRATIONAL SPOT: Great occasions to serve God and His children come very seldom in our lives. But little ones surround us each and every day. INSPIRATIONAL SPOT: Death is not extinguishing the light; it is putting out the lamp because the dawn has come. DUST WE MUST (left): We all take turns doing the menial chores around the station, and that includes program director Ric Schmidt. In the back corridor, you’ll often see Ric cleaning our studio computers’ filters. One scourge of Nome is its ever-present, extremely fine mineral dust. You can clean your home and find a thin layer of dust covering everything less than an hour later. The particles are so tiny, about the size of pollen, that they pass right through most regular filters. At KNOM, we heavily filter all of the air coming into the studio building, but some of that pesky dust makes it in anyway, and it’s a battle to keep all of the equipment clean and healthy. FETAL ALCOHOL SYNDROME affects four times more babies in Alaska than in the United States as a whole. In mid-September, KNOM volunteer Amy Flaherty produced a one-hour special on this entirely preventable disorder. F.A.S., as it’s commonly known, is caused by a pregnant woman consuming alcohol. The resulting damage to the child can be severe. Together with the many other ills faced by the people of this region, such as sky-high suicide, domestic violence and accidental death rates, it’s a problem which KNOM tackles aggressively. 28,300: That’s how many inspirational spots KNOM has broadcast since January 1st, plus an equal number of educational ones. The spots are sprinkled among music, news, programs which discuss important issues, and positive entertainment, thanks to you. THE FAMILY ROSARY has been an evening staple on KNOM for many years. Hat’s off to Lynette Schmidt for producing a brand new set of Rosary programs. INSPIRATIONAL SPOT: Serenity and peace within us do not come from removing outward causes of worry and trouble. There will always be some of those around. Peace within comes from discovering God as our genuine source of happiness. INSPIRATIONAL SPOT: He has no hands but our hands to do His work today; He has no feet but our feet to lead others in His way. He has no voice but our voice to tell others how He died; He has no help but our help to lead them to His side. WORKING FOR “SCALE”: After a thirty-minute battle on the Nome River, KNOM assistant program director Kelly Brabec landed this beautiful silver salmon (left). It was a rare bright moment. 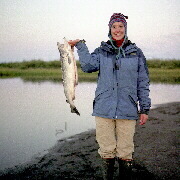 Overall, the fishing situation in Western Alaska continued to be dismal this year. Both commercial and subsistence fishermen, who have traditionally relied on large numbers of fish to provide for their families, caught far fewer than they had hoped. Back then, 85% of KNOM’s revenue was gifts by volunteer nurses who were employed by Nome’s hospital and contributed their entire incomes. Including four nurses, two cooks and a full-time volunteer maintenance mechanic, the staff grew to a record of twenty people. DISASTER is something that our mission has always done our best to prepare for, and throughout the years, when Nome has lost electric power, that planning has paid off, keeping us on the air at critical times. Earlier this year, we showed you the tiny 10-Watt FM transmitters that we will purchase for our village translator stations. They’re about half the size of a loaf of bread. 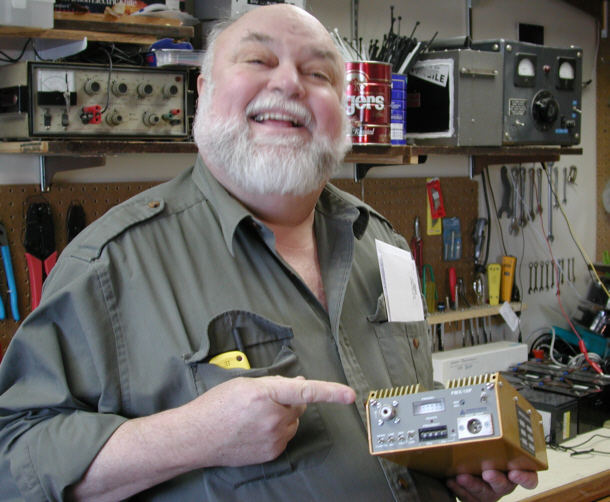 (Left) KNOM engineer Les Brown holds one of the little transmitters, in this image from the May 2003 Nome Static. At present, we intend to keep one spare transmitter on hand. Nome’s emergency officials are excited by that. The little units use 12 Volts, and can be operated out of a car, if necessary. Should Nome face an unthinkable catastrophe, that little transmitter operating out of the KNOM Toyota 4-Runner could provide the public with lifesaving information. 96%: That’s how much of KNOM’s operating income is donations such as yours. You are the strength behind this award-winning radio mission, and you are often in our thoughts and prayers. We remember your intentions at our weekly staff meetings, and in our individual prayers as well. Thank you for making our important work possible! LISTING: We renew our pledge, first made in 1966, that we respect your privacy, and will never provide your name and address to anyone. Thank you for your faith in us. Again, thank you for your faithful support. May you enjoy a beautiful autumn, and may God greatly bless you! INSPIRATIONAL SPOT: Feed your faith by prayer, and all of your doubts will starve.